Real comments from REAL customers! We are not a big company and don't employ a sales team with slick sales scripts to get business. Our reputation has been built simply by providing a great product backed up with excellent customer service. Below are a few comments from our customers. I just wanted to add to this thread, I spoke to Darren for the first time at 9.30 this morning, by 13.00 my new site was live. I was very impressed with Darrens knowledge and also the fact that he delivered exactly what he promised. Better than subscribing to any magazine IMO"
with how you have intergated the control panel option. The whole process has gone very smoothly, and you have been so helpfull and friendly, thanks." "I've just renewed my website representing excellent value and to thankyou for your ongoing support. 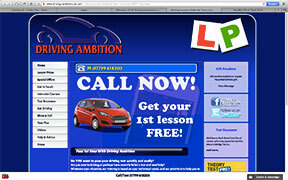 Pupils are still commenting on how much they like the Car Trekking website." "It's going really well, I've had 15 bookings in the last 8 days!! So just want to thank you and your team for doing such an amazing job and putting up with my changes, I'm sure I'm your most fussy customer but I'm getting good results so it's paying off! I'd buy yous a drink if I lived anywhere near! Thanks a million AGAIN!" "Many many thanks for the website, the logo and the great overall finish you have achieved. I am very pleased with the end result and the speed of turnaround. I can't thank you enough." bookings for the new year. "I am absolutely delighted with the finished product, it is excellent and I am really pleased with it. I am sure it is going to make a real contribution towards developing my business and I would like to thank you for all of your advice and assistance and the efficient and speedy way that you dealt with it all. you have produced a high quality site at a competitive rate and your knowledge and techniques have made it very simple and quick from the customers point of view. I certainly will not hesitate to recommend your excellent service to other local firms. Thanks once again for your help"
"The website looks fantastic by the way. Has definately surpassed my expectations." Hi Dave, Good to hear from you. I had a look at your excellent web site. It is easy to navigate and has loads of easily accessible information. DARREN / EMMA WELL DONE!" You and Emma have exceeded all expectations, it's great!" "Website is still working well for me so much so that I have paused the adwords on several occasions as I was receiving to many enquires. Would like to keep up to date with latest improvements as site has been excellent I dont advertise any where else." "Morning Darren. Site looks brilliant and is live already. Well happy. Cheers again guys and I will recommend you to everyone"
"I have a had a website with Darren for a few years now and he has turned my business into a highly successful one where all of my area pages are on Google first page! 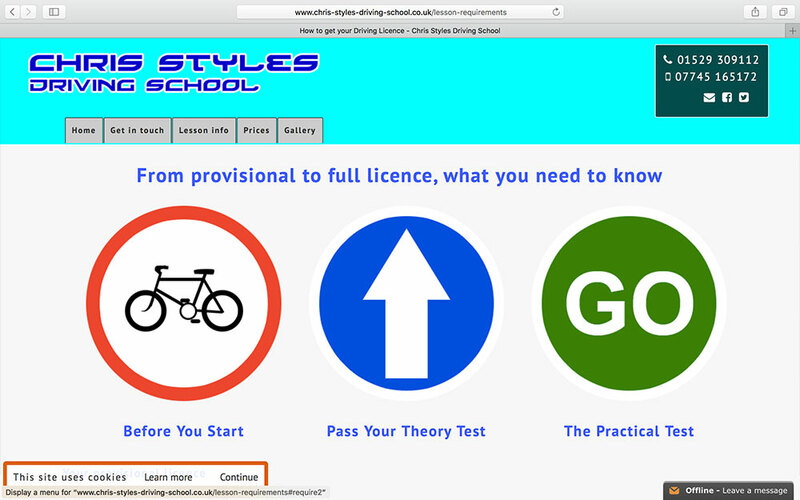 Firstly a Learning Styles page, where a customer can fill in a questionnaire to find out their learning style - great addition for any instructor who wants to adopt a client-centred approach with their customers. Secondly a new diary page which includes automated lesson reminders, a student progress card so the customer can monitor there own development, and finally a reflective log so they can plan their own way forward. I cannot thank Darren enough for what he has done for me and my business! This man is a genius!" "Thanks for all you've done for me in 2011, my website still attracts about 50% of my business and I always recommend DIS, when talking with other instructors, as the only company to deal with." "Just a quick note to say thanks for getting the site up and running so fast, it looks great. Had a go at altering a couple of things this morning and you were right it really couldn't be easier. "The website looks great including the mobile version. Many thanks for all of your amends. Everything looks perfect." "The e-mails* were a welcome addition to your product. The content was perfect, it read well and lead me through the unknown areas of managing an Internet site. I have learned loads from the e-mails and have so much to try out which otherwise I would not have known about. Already we are seeing an increase in potential customers contacting us compared to the now redundant site. *Note : Once a site goes live, you will receive a series of emails giving you tips and pointers on how to get the most from your site." "WE APPRECIATE ALL THE ADVICE YOU ARE GIVING US.WE ARE VERY IMPRESSED WITH YOUR AFTER SALES SERVICE AND WILL CERTAINLY RECOMMEND YOU TO OTHER PEOPLE." "Thanks Darren,fantastic job by done by Emma." Sent via BlackBerry® from BT"
"Having seen some of Darren's work I decided to go alone and have Darren build my website , glad I made the right choice, the whole process was made so easy with little effort from myself, highest recommendation." "Its been a while since we had reason to communicate. I genuinely hope that all is well with you and your family. Also I must thank you for your flawless continued customer support. Thank you. I'm often left amazed by your ongoing updates to my site, BRILLIANT. The video of the test change, pass plus stuff, resources updates, the list goes on. I am genuinely grateful and truly pleased with the professional service you have continued to provide." Wow! you definitely surpassed my expectations on your latest work. I expected the Polish version to just be a printable version, what a pleasant surprise to see the way that you did it, way better than I imagined, my Polish pupils will be delighted. I also didn't expect an immediate response to my request for the new Special Offers backgrounds, I particularly like what you've done with Eco Safe Driving. 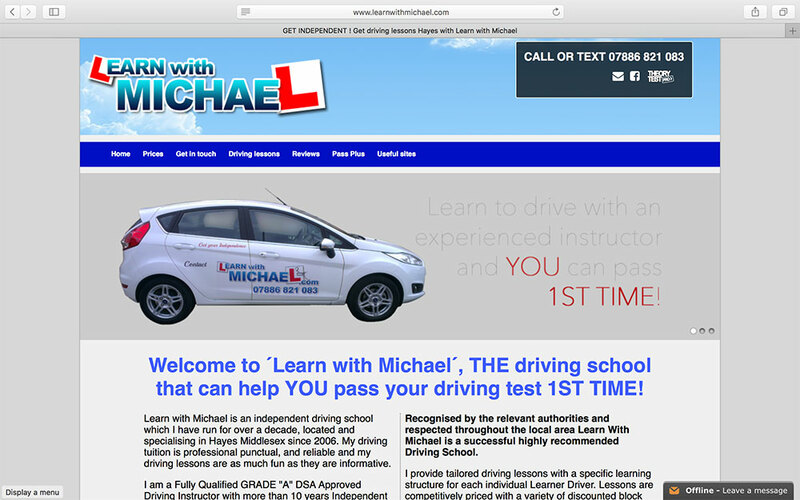 After going independent, I still consider that getting DIS (Driving Instructor Sites) to design and maintain my website was the best decision that I've made to date and I consider that one of Darren's best was having you on the team. "I found it pretty straightforward to use and understand the control panel. The content was clear, and I really didn't have much difficulty - and I know very little about any of this! I had no trouble following your clear directions. I think the timing of emails was probably just right. I was able to plod through them steadily, and it didn't feel like it was too many all at once. At the minute, Darren, I think for a complete novice like myself, there was enough information/topics for my needs. Maybe for a person more familiar with the whole thing, more could be put in, but I don't know what that would be! It is also very reassuring that you say that it's no problem if I need to ask for help, and more than just once. I know people often say things like this, but in actual fact, when asked for help, they really don't want to be bothered. It doesn't seem to be the case with you! I am aware also that I have had a few queries, and I am grateful for your assistance with them. (Comments in response to emails sent to all new customers to give help and advice about using the control panel and enhancing their site)." "Thanks, I have to say I am really pleased with the prompt attention that you give and will definitely be recommending you to others"
"I am really really pleased with the site, I think it looks brilliant. You really did do what you said you would do, which is pretty rare these days! You offer a fabulous service for an amazing price, and as I said before, I wouldn't hesitate in recommending you." "I have just got to put fingers to keys to give Darren and Emma a big thank you ... in this world good customer service is rare and in the website industry its even rarer (if that's a word). As a company I have gone through 3 website companies and been let down or scammed by all 3 at a massive financial cost and mental cost also. Darren and Emma this is just a massive thank you from me and Ali @ xlr8 Wales"
"Hi Darren just a note to let you know that my original website (which I thought was a good site) only produced one new pupil in about six months. 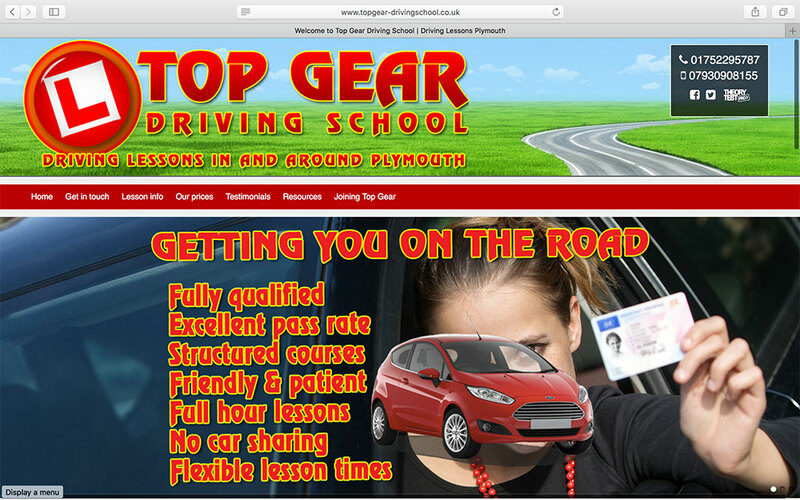 Since having the website you designed on average I get two or three new pupils a week. But more important I don't have to do any sales patter, they just ask to be booked in! "You have done a most fantastic job and your customer service is second to none thank you for all your help :)"
"Just to let you know well pleased with the seo work your doing . I've just noticed I'm ranking in the top 5 for a lot of areas I cover (driving lessons Blackrock,driving lessons bray etc etc which should keep the adwords bill down so what ever it is your doing please keep up the good work. "May I first thank you for the lovely web site upgrade , I is a happy bunny . Nice 3D car effect, you always give a prompt and honest service." 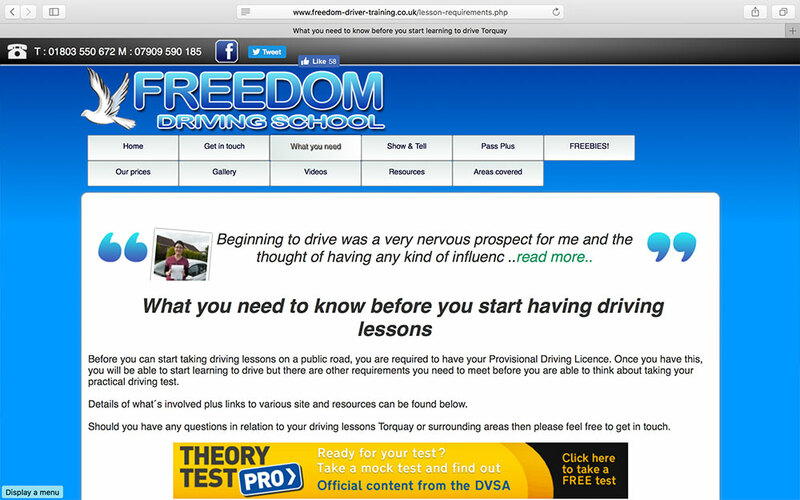 "I wanted a website for my business and had been recommended to Darren by a fellow driving instructor who also had a website with driving instructor sites. I decided to contact Darren and he was quick to answer any questions I had regarding the whole process. He designed me a draft and once I was happy with that the site was live! 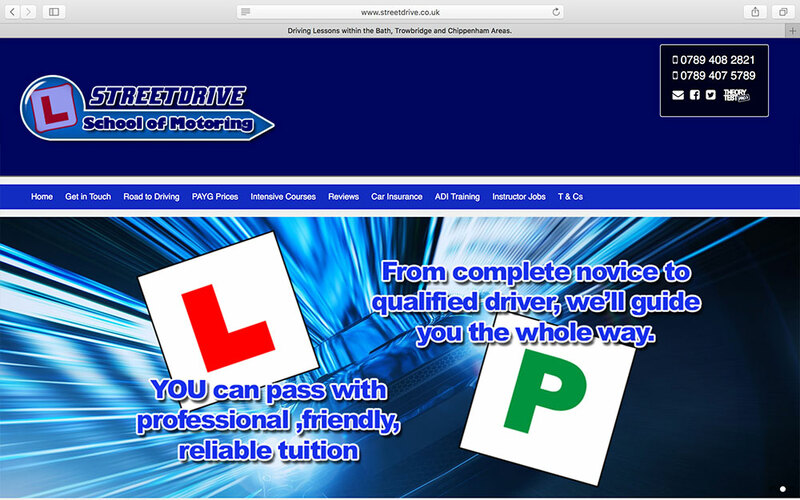 It has given my business a completely professional look and the feedback I have received from new clients has been great, many say how informative the website is for anybody wanting to learn to drive. I would also like to thank Emma as well for some additional work she did for me, which has really helped the image of business. Even now if I have a query regarding my site the support Darren and Emma give is fantastic. Many thanks to you both." 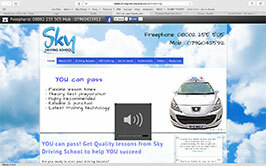 "I would like to thank you and Emma for completing my web site. Everyone who has seen it says how professional and clear it is, and I'm very happy with it. Before I contacted you I was quoted �1200 by another company and was told it will take between 4 - 8 weeks. You have done a much more efficient job and also saved me a lot of money. Thank you." "Saw what you did, looks good to me and has fullapproval from a couple of my competitors who phoned me to ask 'could i possibly leave some pupils for them to get.'" "This mobile website is amazing! There is no competition. It blows them out the water!!" "What can I say about your professionalism? THANK YOU!! Thanks for making my new site so quick and getting up and running so fast, Yet again an amazing job from you and your team!! And seems so much easier to sort everything out, had everything done in no time. The area pages are much easier to add and the walk through on how to set your emails up was perfect! Hopefully this time next year I'll have 5/6 Instructors!! I've got 1 already. Had 15 pupils book with the new instructor in 10 days!!! I'm Loving the Page One Rank 1 for south shields... I'm always checking my ranks and nearly had a divorce as I keep reading my google ranks to her like I'm calling bingo numbers.. Ha." "Today I got three new pupils. 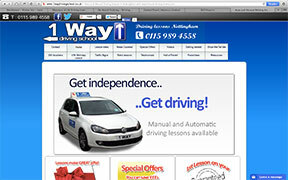 The site is working good especially when we are deep in snow people don't usually book lessons." "Would just like to say a big thanks to instructor sites for all the work you do! !, very easy to work with you on changes to the sites when needed and when we first spoke on the phone about doing a website for myself I felt at ease and there was no hard sell, I'm not the most brilliance on the technical side of things but you make things nice and easy with the control panel to make simple changes to the site but even then your always on hand to help, also since doing the SEO work for my site I have seen it stay on page 1 for the area I cover. "We are absolutely delighted with our new website, it looks fantastic and represents the best value that money can buy. We had bookings within 2 hours of the website going live, our bookings ratio has more than doubled since our new website went live, it has already paid for itself. The professional way you dealt with our enquiry and the speed you got our website up and running was amazing, a first class service all round. Even the customer care and after support is first class, faultless in every way. Thank you very much, we consider ourselves very lucky to have found your services. If any potential customer would like to know more about the service offered at this site, please feel free to contact us. 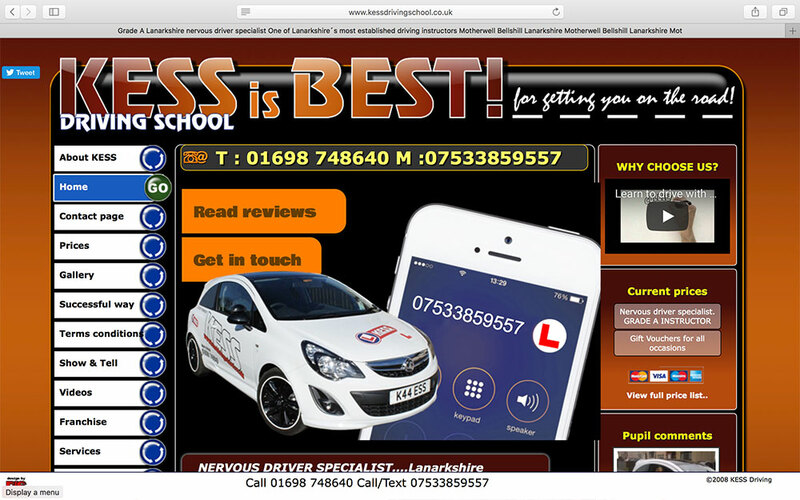 We would have no hesitation in recommending your services to other driving schools." "The only thing I can say about the instructions is, if I managed to do what I've done with them then anyone can. Thanks for all your help, it's been nice to know there is someone you can get help from, but don't relax just yet!" "Recently a mother of a pair of students said that she had contacted me because of the professional appearance of the website - just up to me to deliver now, no pressure there then!!" 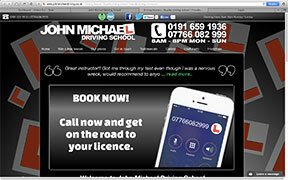 "Hi Darren - just had a call complimenting me on my fantastic website! I recommended you and he may be in touch to get his own site. I complimented you and Emma on how efficient you both are at responding to queries and amendments. 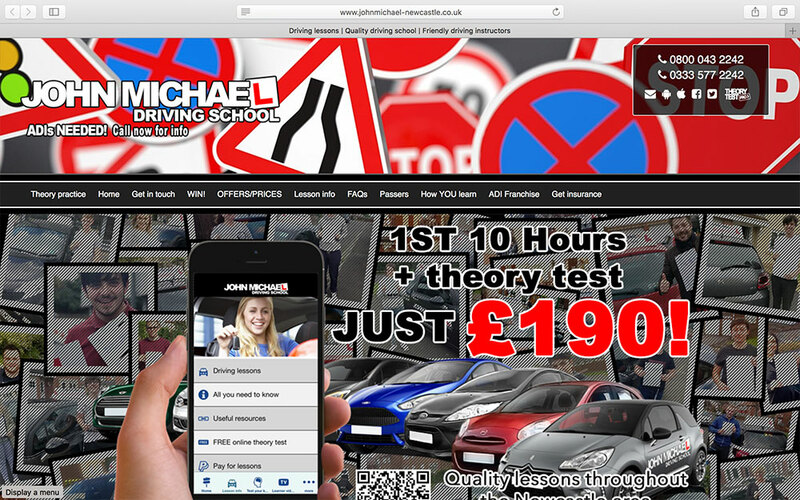 "As my existing site got a bit dated ,I found Driving instructor sites .I had a read at the comments left by others and decided to give them a go,from the first call Darren spent time explaining the process to me not in a hurry to get of the phone,after the call I made my mind up to place the order for the new site . Within hours Emma had my draft site was ready, I asked for the template to be changed and again the new draft was through in hours ,I would like to thank Emma especially for her work on the site and her patience for putting up with all the changes and emails with information for the new site you have done a fantastic job guys and would defiantly recommend to others." 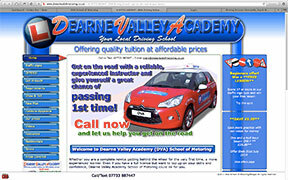 "I had one of my colleges from my last driving school contact me re my Web Site, he thought it was brilliant and very professional, that Darren is down to you and once again many thanks." "Due to my website i'm taking more calls than ever and have decided to put my costs up!! This is down to the great job you've done with it!! My website has probably paid for itself 3 times over and it's only been going a couple of months!!" WOW, I'm so pleased with the look of the mobile layout it looks really good. I'm not going to change any of the colours etc they all look striking and easy to read. Thank you so much for this Darren, I really appreciate it." 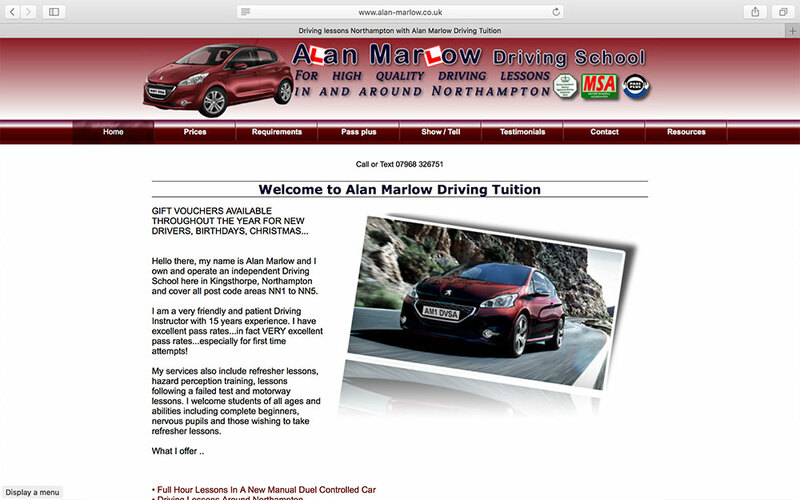 "I must just mention that my driving school was already doing rather well before I had your web site but since I introduced your web site two years ago my business has shot through the roof, without doubt because of your help. I am turning away business every week as I am so busy. Without doubt the web site has paid for itself and more! Thank you so much!" I'm wondering where I'm gonna find instructors from to give all these pupils to! I took a instructor on last Monday and he's full!! I've had a few of them myself and they said it was the website that sold them, it was very professional and easy to use. One said it was fast and works when others didn't. It's all about that website! Darren's comments - Johns' site had slipped off Google page 1 to page 2 for a few of areas. The new mobile layout was released and automatically updated on his site and he was soon back up to page 1." "... many thanks as always, the business is booming , working 12 hrs monday to friday and half a day saturday , looking around for a part time instructor so I can pass on some work before I burn myself out! All enquiries who come through the web site always comment on how professional able the site is , your web site has attracted so much work , many thanks for a brilliant job which you do"
"Many thanks, I will be sure to recomend you to any instructors that need a website"
"The website looks amazing! What an amazing job, I'm really really pleased with it." "Hi I had a Web site with you a couple of years ago but got talked into going with yell.com , big mistake could I please come back." "Hi Darren just wanted to thank you so much for the website you created for us. I have had a lot of people complimenting on how amazing it looks from my previous site I had. You have been very helpful every time i called you. "Would just like to thank everyone who has worked on the new website, we all think it looks great. I would not hesitate to recommend you to others who are looking for a new site. After my first enquiry, the site was live in just a few weeks*, and any problems were resolved straight away. Thanks for doing a great job and keep up the good work. *A note from Darren.. This site has some custom features including an exclusive 'Hall of fame' feature which automatically puts passers photos and details onto a driving licence which took longer than usual. We normally have sites live within 2 days of ordering." "Thanks guys for your continued flawless support. Really really impressed with the speed and efficiency you continue to demonstrate. I'm loving It." "I would just like to thank you both for all your efforts in getting my website and business up and running! It’s very daunting to know who and what to trust, but you came highly recommended and to be honest have more than exceeded my expectations! My website is looking great and already I’m having positive feedback and questions on who designed it. You have made it easy to navigate – and both your on line support and replies to my endless e-mails have been first class! 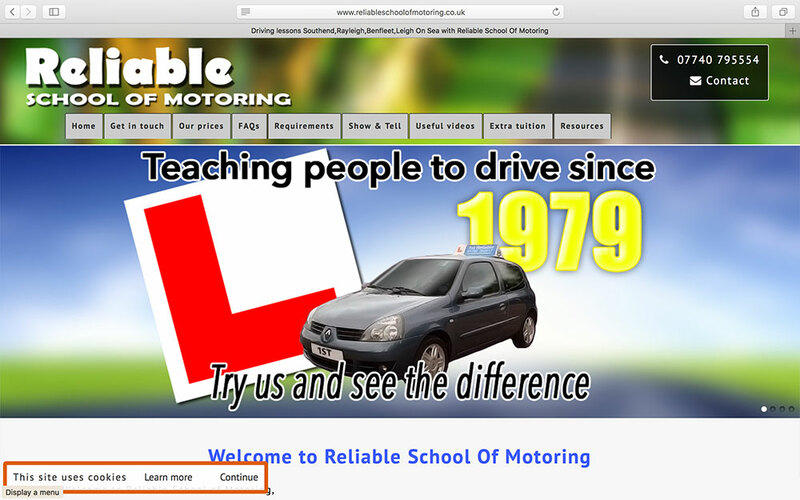 I would have no hesitation in recommending you to any potential ‘Driving Instructor’, looking to set up a website and look forward to many successful years working with you. Your ‘on line’ booking system is also a great idea providing immediate availability to customers at a reasonable cost. Have a great 2014 – and thanks both once again." "A great big thank you to you and the guys behind the scenes for a cracking website. A few months ago I was so confused on what or how to start a website. Any one out there, well recommend and the after support is top." "Knowing nothing about computers the prospect of setting up a website was a daunting one but Darren did so much of the work for me that I only needed to send him one e-mail and the site was up and running. Whenever I have requested changes, Darren has dealt with this extremely quickly and has also been available to offer a great deal of advice along the way. Since going live in 2006, my advertising budget has been dramatically reduced as I am getting more and more pupils finding me through my site." I cannot recommend Darren highly enough"
"I am so impressed with what you both have created. It is a great business tool!" "Just wanted to say the updated mobile site is looking fantastic mate! Just viewed my site on a iPad for the first time yesterday since the updates and very very impressed!! "Many thanks for being so quick - I've just had a look at the site and it looks great!!" "Just want to say a big thank you for the service you have provided since starting with you. Trusting my business name with someone like yourself was a little scary, but you guys have been great!!!! Just want to wish you all a VERY merry Christmas and wish you all the success in the world for 2014. People, generally don't appreciate businesses and just hammer down the price to get the lowest price possible, but I realise we are all in business to make a profit. You guys offer a great service at a very reasonable price. I have recommended you to 8 businesses already and will continue to do so. Content - Very helpful, self explanatory especially to a low computer user like me. Readability - Mails made a lot of sense and very easy to understand & follow, still referring. Timing - Ideal timing as they pushed me into reacting although still a few things to do. Information - If anything comes to mind then I will gladly get in touch. Having spoken to some about other web designers I landed lucky. Service, help can't be faulted. Will without doubt recommend your company." "Whilst I am emailing you I would like to take this opportunity of thanking you most sincerely for your kind help and assistance over the past two years, it has been a pleasure to do business with you. Since purchasing one of your website we have seen our entire business more than double, that's enquiries, instructors, profit, the lot., so it is this I must send you a big thank you for !! "I found your service very professional and your after sales service second to none, and you are always ready to help sort out any problems should they occur. I would highly recommend you and if anybody wishes to promote their company or services you are definitely the man to see.